John Evans, a Gardant affordable assisted living community, will celebrate its 10th anniversary on Nov. 16. The community in Pekin, Illinois, serves seniors of all incomes, including those on Medicaid. 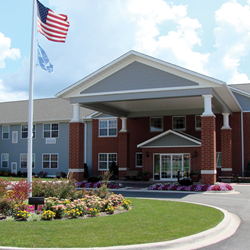 Since the beginning, John Evans has established itself as the premier affordable assisted living community, and we are proud to say we continue to set the standard for assisted living in the Pekin area. John Evans Supportive Living is celebrating 10 years of service to area seniors and their families with an anniversary party from 4:30 p.m. to 7 p.m. on Nov. 16. Over the past decade, John Evans has spent more than 5 million minutes touching lives and providing love, compassion and care for residents. The community has served more than 500 families since it opened its doors. John Evans also has a significant impact on the local economy and employs more than 60 people. Much of the success can be attributed to the people who work at John Evans. During the celebration, the community will honor employees who have been with the community for the past decade, including Administrator Melanie Daniels, Business Office Manager and Move-in Coordinator Marj Warren, Resident Services Coordinator Beth Squires, and CNAs Teresa Allcock, Mindy Cross, Janelle McMahon and Shasta Pounds. Two residents – Patricia Bong and Anne Goldberg – who have lived at John Evans since the building opened will be honored as well. John Evans Supportive Living combines residential apartment home living with the availability of personal assistance, help with medications and a variety of convenience and support services. “We provide a wonderful alternative to a nursing home or to struggling alone at home,” explained John Evans Administrator Melanie Daniels. Residents live in private apartments that they furnish and decorate to their tastes. Each of the studio and one-bedroom floor plans includes a kitchenette, spacious bathroom with shower and grab bars, individually-controlled heating and air conditioning, and emergency alert system. Certified nursing assistants, working under the direction of a licensed nurse, are on-duty 24 hours a day, seven days a week. Meals, housekeeping and laundry are among the included services. “Residents also benefit from all of the opportunities that are available to socialize with friends and neighbors and participate in activities and special programs,” said Daniels. John Evans Supportive Living is fully certified to operate through the Illinois Supportive Living program. Gardant Management Solutions is the largest provider of assisted living in Illinois and the 12th largest provider in the nation.